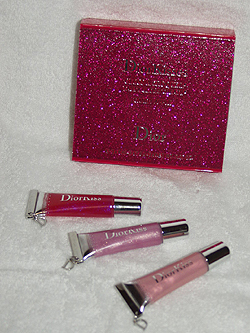 Fashion Asia: DiorKisses Limited Edition! Must Have! DiorKisses Limited Edition! Must Have! I actually just baught it yesterday. But my box is blue with glimmer. Also VERY beautiful! And i LOOOOVE the way the lipgloss looks on the lips. It was the last box (i bought it in Denmark, where I am from) so i begged my mom for taking it! Haha. Some say the smell iznt that nice? smells like "laichee" (a type of fruit).